Home / Blog / Engagement rings / Platinum vs. White Gold. Loyes Diamonds talks about Platinum versus white gold engagement rings. Platinum is heavier than white gold and is also more expensive. When you see a new white gold and platinum ring side by side, they will look very similar. However, white gold is not a naturally white metal and it requires rhodium plating every 18-24 months to keep it fresh. Platinum tends to dull and requires polishing every 6-18 months. Platinum is denser than white gold and will wear less in areas such as on the prongs/tips. Platinum is softer the 18k white gold but not 24K gold. This means that although the metal might scratch a little easier – the metal will not be lost but only moved around on the mount (that is to say it is more malleable) When white gold is scratched a little of the gold is usually lost. Its only a very minor thing we know but facts are facts. 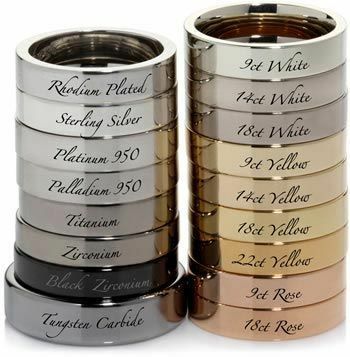 Regarding white gold – in time the rhodium plating will wear away, this will depend on the quality of the plating itself, if poorly plated then within 6 months signs of wear will appear, however, if properly plated it will certainly last at least 3 years. White gold when rhodium plated actually adds a minute layer of metal to the ring as opposed to polishing platinum which removes a layer. This means that your mount will last much longer and cost you less in maintenance costs, not the contrary. Most Jewellers try and push platinum over white gold because it is more expensive and they make more money from the sale. A platinum mount is almost twice the price of a gold mount. At Loyes Diamonds we supply both platinum and white gold.